Map It! 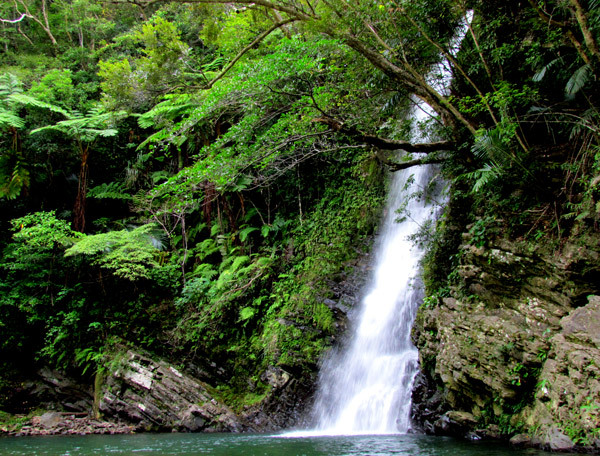 Okinawa: "Hira Falls ひら滝, Nago City"
A very photogenic waterfall lies on the east side of Okinawa along the Aritsugawa River in a small town called Teniya of Nago City. 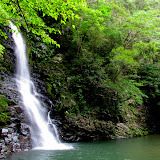 She is another one of the least known waterfalls here on Okinawa, but she is not shy on displaying her thundering beauty. She is the very proud and commanding, Hira Falls (ひら滝). In Japanese she is referred to as Hira-Taki and in Okinawan dialect, Hira-Tachi. 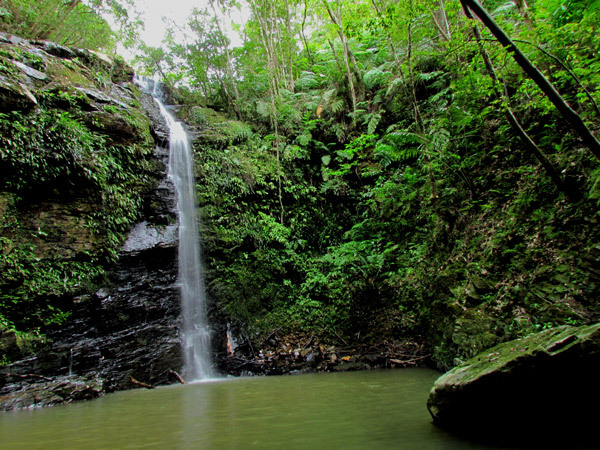 Both suffixes, 'taki' and 'tachi', mean waterfall in their respective languages. When you first arrive at the base of the falls, a sense of deja vu will hit you. Hira is very reminiscent of her sister, Taa, who lives in Ogimi Village on the west side of Okinawa. Their vertical heights are approximately the same – roughly 50 meters. What makes Hira Falls special however, is that the layout of the land makes for great photographic moments at different angles that you couldn't easily achieve at other waterfalls here on Okinawa. Please see photo album above or click here to see other photos. An Okinawan, familiar with the waterfall, was asked if there was a special shrine or sacred grove around this waterfall where Okinawans pray. His answer was yes. We just happen to be looking at her the whole time. FOR SAFETY, PLEASE READ EVERYTHING BELOW BEFORE YOU GO! Physical Ability. Recommended for young adults and above with good physical agility and coordination skills. I do not recommend bringing children on your first trip to this waterfall. After the first go-around, parents can gauge the safeness for their children. It is not a difficult trek, however, it is not a flat path either and there are narrow areas where you can trip or fall, and the vegetation along the trail may be too overgrown where snakes can hide. Hopefully, over time, the trail may get beaten down enough where this becomes less of a concern. The level of difficulty of this trek is between that of Taa and Fukugawa II, but more closer to Taa's level. The Starting Point. 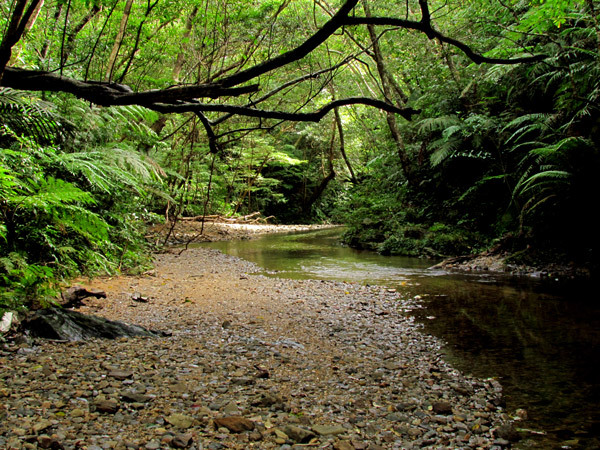 The most difficult part of this river trek is finding the starting point. This is really an off-the-beaten path waterfall. Vehicle directions to the starting point are at the very bottom. Please study them carefully. There are NO official markers or signs pointing you to this waterfall. You have to study the Landmarks provided. 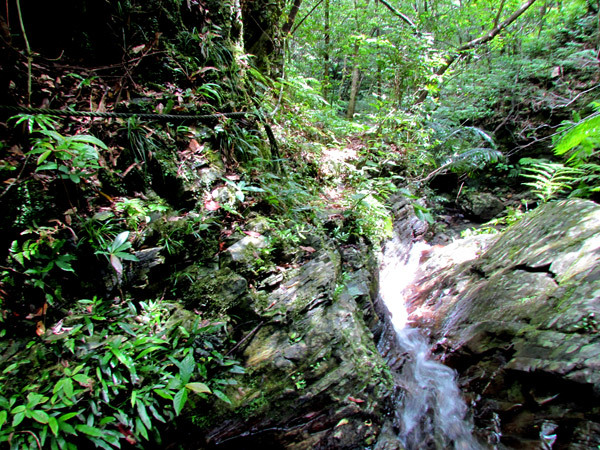 The trail starts at a small creek, near a road, that connects to the main river (Aritsugawa) which feeds the Hira Falls. The Trail/River Trek. The trail weaves in and out of a small creek that connects to the main river. Sometimes you are in the water. Sometimes you are on land. It is about a 20 minute river trek. 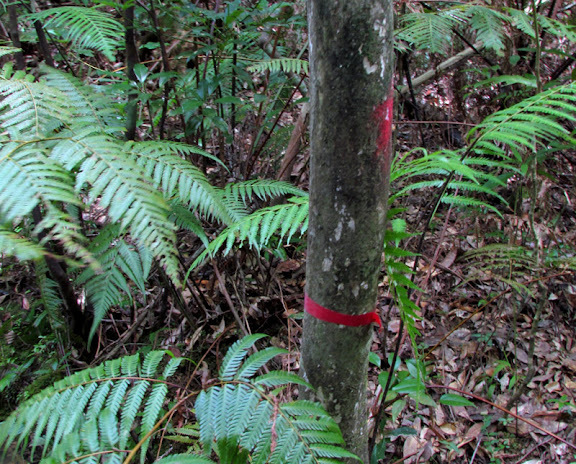 You will see 'red tape' or 'red spray paint' on trees along the trail leading you the way. However, they are sometimes easy to miss. As long as you let the creek guide you, you will reunite with the marked trail again at some point. The trail may be at times narrow, or not as beaten down, so please watch your step looking for possible snakes. At one point at a difficulty pass in the creek, you will see a guide rope to left. The 'Y' and the First Waterfall. Near the end, you will come across a noticeable 'Y' fork on the creek. If you go right, you will come to a dead end about 3 minutes later, however there is small waterfall tucked around the corner with a decent size pool of water. THIS IS NOT HIRA FALLS. Continue to the left of the 'Y'. Hira Falls will be around the corner 100 meters away on the left hand side. The Dangers. Potentially the most dangerous part is a run-in with the Habu. Because the path weaves in and out of the creek, you are sometimes forced to go on narrow vegetated paths. Recommend bringing a guide stick to brush away the trail and to remove spider webs. Spider Webs. You will see many spider webs along the way. Just be aware. Wear appropriate clothing and highly recommend wearing gloves. Fresh Water Eel. At times along the way, you may see a fresh water eel. This is just for your awareness and to not get overly excited and fall when confusing it with a snake. It is not certain what species/subspecies they are, but they may be the Giant Mottled Eel (See the Churami Aquarium website http://oki-churaumi.jp/en/area/freshwater-life.html). Several were seen in this area. Snakes. Always be vigilant for snakes when in the wild. Wear appropriate footwear/protective gear and bring a guide stick to remove brush. Take your time. There is no need to rush. Mosquitoes/Critters. Recommend using bug repellant and wear appropriate clothing to protect your skin. The Horse Fly. This is one pest worth mentioning and writing an entire paragraph on. If you get bit by one, you will understand. For some reason, they are frequent in this area of Okinawa and probably just during the hot season. They are tremendously annoying – to the point you will be rooting for Okinawa's legendary 'Banana Spider'. Their bite can be very painful – even through clothing, and possibly leave an infection if left long enough on your skin. The Okinawans refer to these flies as 'Abu'. Do not be surprised if 'one' seemly 'stalks' you along the way to the waterfall. You will find yourself constantly swatting the air around you. This is another reason to avoid bringing small children on your first trip, or at all. Solutions. There is no 100% solution to this problem during the hotter months. There may be less or none during the colder months. If you can tolerate the heat, you can wear clothing that covers your entire body along the way to the waterfall and then change when you get there. This may mitigate the sharp pain you will feel if they bite you. A can of 'Off' Spray or equivalent may or may not work. Cover, the back of your neck with a wet towel. Cover, your head with either a hat or wet towel. You will know when they approach you. They make an unforgettable sound. To temporarily get them away from you, try swinging a towel violently in a helicopter manner as if you are swatting them. You may at least get 5 minutes of peace. According to the Orkin Pest Control website, horse flies are attracted to dark objects so wear clothing accordingly. Ehow.com may also have some house-hold remedies that may be of help. Thankfully, they usually harass you one at a time. Getting to the Top of the Waterfall. The terrain is too steep and densely vegetated to get to the top safely, and there is no trail up there. Highly recommend making no attempt to go up. This is very, very unsafe from the base of the waterfall. A safer route is currently being reconnoitered, however, it is no where near the trail of this waterfall. This post will be updated once a safer route has been verified. Going away from the Waterfall. Once you meet the Aritsugawa River, Hira Falls will be immediately on your left and the river continues on to the right. It flatten outs tremendously but then ultimately gets little deeper making it tremendously difficult to continue. 1. Plan on getting wet up to your knees. Wear good shoes/boots with traction (not tennis shoes). 2. Sometimes, it best to walk in the water than on land or balancing yourself on the rocks. 3. Nearest Medical Facility. For U.S. Services members the nearest medical facility will be at Camp Scwhab about 30-40 minutes away to the south. 4. GPS for the trail's starting point is N26 34.927, E128 6.279. Recommended GPS Rally Point for emergency vehicles is N 26 34.393 E 128 07.328. It will be a large tree clearly visible near Highway 331 and is one of the Landmarks designated in the map above. GPS to the Hira Falls is N26 35.121, E128 6.340. 5. Recommend a small backpack of snacks, a bathing suit to go swimming (optional), bug spray, towel. And don't forget your camera. There are nice areas already for natural shade. Pack out what you pack in. Leave no trace behind. 6. Leave an extra set of clothes and shoes in the car to change into later. More than likely you will get wet and dirty. If it's summer, you will be sweating. 7. Bring a hiking buddy with you. Parking. There is only one area near the starting point that you can park your car. It's big enough to park maybe 2 cars. If this is full you have to park further down the road but off to the side. This is somewhat a narrow road. Please leave plenty of space for truck-size vehicles and please do not park in such away that would block farmers access to their farms. Directions. (Please Read carefully). 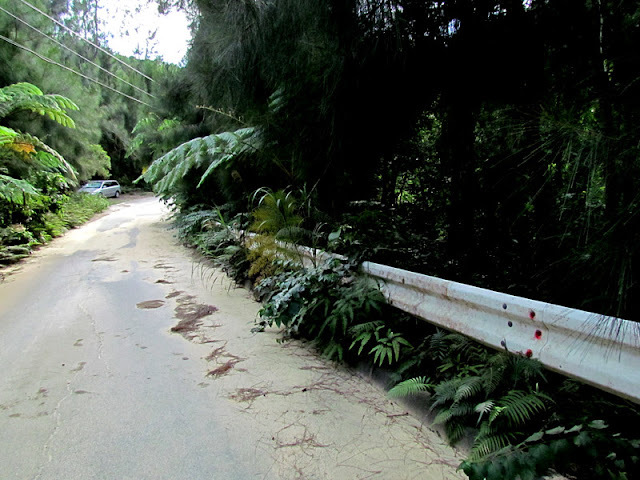 Your venture starts from Highway 329 in Nago. Then get on the Highway 331 turn-off, heading north. 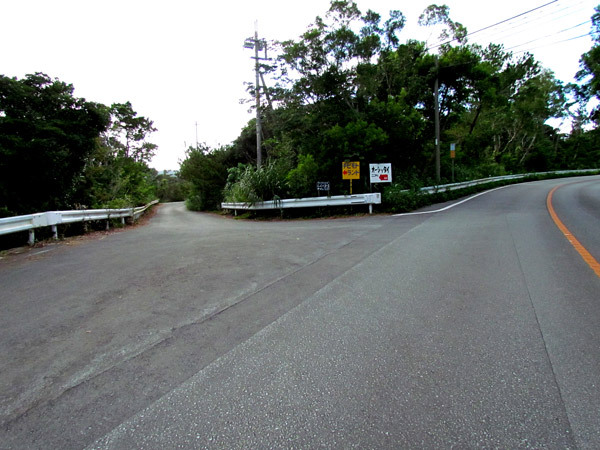 You will now be on the east side of Okinawa (The Highway 329/331 turn-off is about 10 minutes north of Camp Schwab by car). 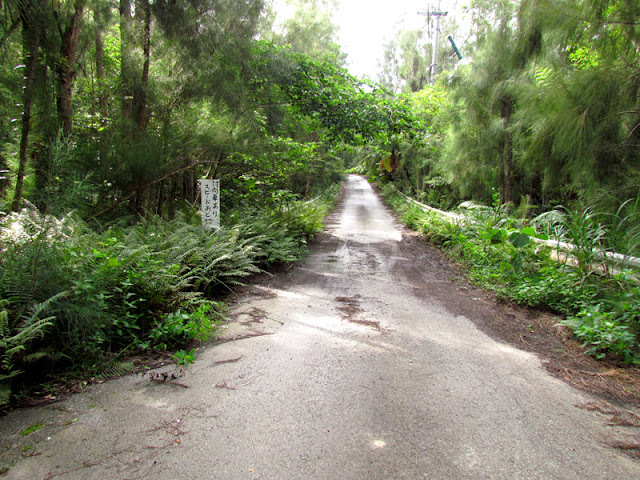 Another 8km you will past the Kanucha Resort. Travel another 7.5 km and you will be arriving in Teniya. At some point you will be traveling around a sharp 'bend' in the road. To your right of this 'bend' will be a very noticeable old and large pine tree. On the left side and on the opposite side of the road will be a small elementary school building. 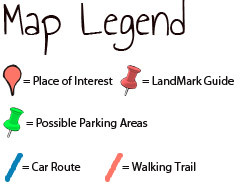 These are Map Landmarks provided in the above map. 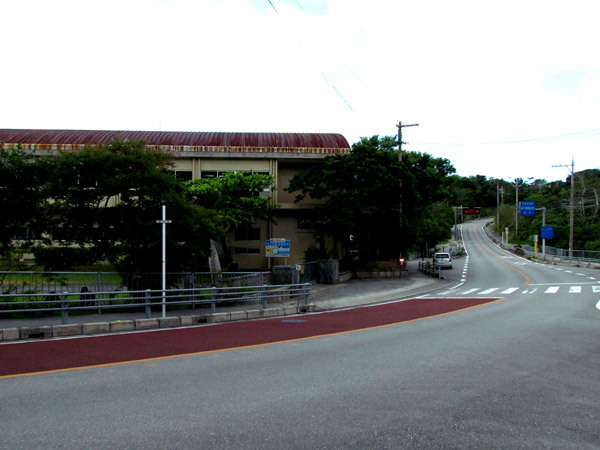 Once you pass the elementary school, look for a second through-road on the left. It will be a 'Y-like' fork intersection with signs. This is where you turn left as you leave the 331. This is the beginning of the blue designated route in the map above. From there, go at a very moderate and safe speed. Farmers and delivery trucks still travel these areas at high speeds. The roads are medium size in width and are curvy. The next landmark to look for will be on the left hand side 2km later. 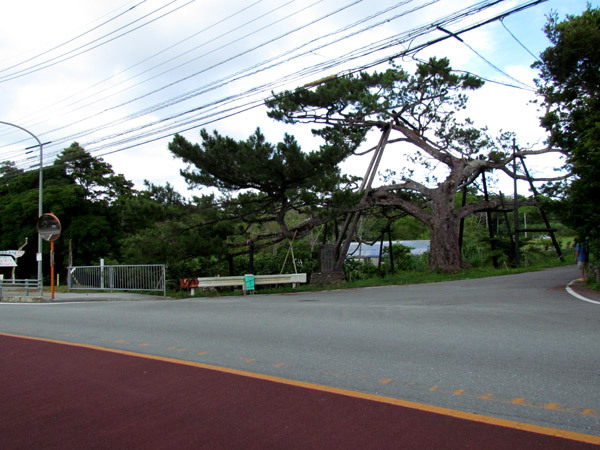 It is a small pull-out area where you can park your car. Please look at this picture. There is only one like it in that area. If you get to here then you known you are in the right spot. (Eventually, if you go past this, you will see a sign down the road that looks like this on the left. If you get here, you gone too far!!!) Park your car at this pull-out area or in the immediate area off to the side. Do not block any roads that leads to farm land. 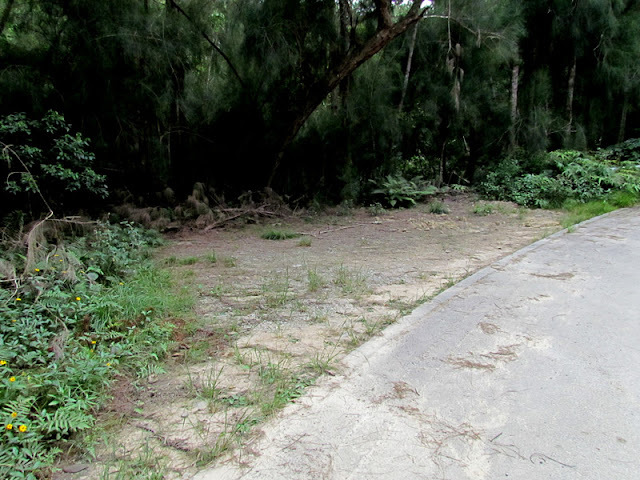 From the pull-out area, you have to backtrack on foot down the road for about 100m as if you are going back to the 331. As you are headed in that direction, look for 3 small 'red dot's sprayed painted on the white guard rail. This marks the entry point to the path. From there you will see a small trail that leads you down and connects you to a small creek. You will also see 'Red Tape' and 'Red Spray Paint' along the way. If you look at this picture you will see the car parked in the background (at the Landmark). You will also see those '3 Red Dots' to the right on the guard rail. Other waterfalls in Okinawa. Azaka Falls (Ogimi Village), Fukugawa Falls (Nago City), Kijoka Falls (Ogimi Village), Meoto Falls (Higashi Village), Ogimi Waterfall (Ogimi Village), River Trekking to a Nameless Waterfall (Fukugawa II) (Nago City), Taa Waterfall (Ogimi Village), Todoroki Waterfall (Nago City), Nameless Waterfall (Kunigami), (Aha and Hiji Falls not listed yet). Let's go back and red-tape the whole trail so I don't get lost, again !